Aspergillus fumigatus, an opportunistic fungal pathogen, is responsible for multiple airway diseases of an allergic and a nonallergic nature. In a murine model of invasive pulmonary aspergillosis, resistance is associated with a decreased lung inflammatory pathology and the occurrence of an IL-12-dependent Th1-type reactivity that are both impaired by IL-4. In the present study we assess the ability of Aspergillus crude culture filtrate Ags and the recombinant allergen Asp f 2 to induce protective antifungal responses in mice with invasive pulmonary aspergillosis. Similar to what occurred upon nasal exposure to viable A. fumigatus conidia, treatment of immunocompetent mice with Aspergillus crude culture filtrate Ags resulted in the development of local and peripheral protective Th1 memory responses, mediated by Ag-specific CD4+ T cells producing IFN-γ and IL-2 capable of conferring protection upon adoptive transfer to naive recipients. Protective Th1 responses could not be observed in mice deficient of IFN-γ or IL-12 and did not occur in response to Asp f 2, which, on the contrary, elicited high level production of inhibitory IL-4. The results show that Ags of Aspergillus exist with the ability to induce both Th1- and Th2-type reactivity during infection, a finding that suggests a possible mechanism through which potentially protective immune responses are inhibited in mice with the infection. However, the occurrence of Th1-mediated resistance upon vaccination with Aspergillus crude culture filtrate Ags, suggests the existence of fungal Ags useful as a candidate vaccine against invasive pulmonary aspergillosis. Aspergillus fumigatus is a ubiquitous and opportunistic fungal pathogen for humans and animals. It is associated with a wide spectrum of diseases, ranging from benign colonization of the lung, allergy, and autoimmunity to life-threatening diseases such as invasive pulmonary aspergillosis (IPA)3 or allergic broncho-pulmonary aspergillosis (ABPA) (1). Although Candida species are still considered the predominant fungal pathogens among immunocompromised individuals (2), the increasing importance of aspergillosis is widely recognized (3). IPA, characterized by hyphal invasion and destruction of pulmonary tissue, is a leading cause of attributable mortality among patients with hematologic malignancies (4) and aplastic anemia (5) and among solid organ transplant recipients (6). Aspergillosis has recently surfaced as a frequent complication in critically ill neonates (7) and in patients with advanced HIV infection (8), although the highly active anti-retroviral therapy has dramatically reduced the risk of opportunistic infections in the latter (9). Airborne transmission of fungal spores is the major route of Aspergillus infections in immunocompromised individuals (10). Some patients, however, may have Aspergillus colonization of the nasal sinuses from where endogenous spread to the lungs may occur, causing IPA (11). In these cases the exact pathophysiology of IPA manifestation and the way in which it disseminates to local and distant sites are not completely understood. Although the release of fungal metabolites with immunosuppressive activity may contribute to the pathogenesis of aspergillosis (12), local cellular defects in the innate and adaptive immune effector mechanisms are major predisposing factors of the host to IPA (13, 14, 15, 16). Resident alveolar macrophages ingest and kill resting conidia, largely through nonoxidative mechanisms, while neutrophils use oxygen-dependent mechanisms to attack hyphae germinating from conidia that escape macrophage surveillance (13, 14). The effectiveness of this system is evident from the observation that challenge with even large numbers of conidia fails to cause disease in immunocompetent animals (17), and recognized major risk factors in humans are defects in phagocyte functions, such as those occurring in chronic granulomatous disease (18, 19), cortisone-induced suppression of macrophage conidiocidal activity (20, 21), and chemotherapy-induced neutropenia (22). Increased risk of a chronic form of IPA that is independent of neutropenia and corticosteroid therapy has been noticed in patients with HIV (8), who also showed a defective effector activity of neutrophils against A. fumigatus (23). The evidence that IL-10, produced in increased levels in HIV infection (24), may have a pathogenetic role in invasive aspergillosis (25) indicates that dysregulated production of Th cytokines may contribute to the pathogenesis of IPA. Recent findings seem to support this observation, as human lymphocytes responded to A. fumigatus conidia in vitro with activation, proliferation, and production of Th1 cytokines (26), and pulmonary aspergillosis was observed in the hyper-IgE syndrome (27). In a murine model of IPA, the production of Th1 and Th2 cytokines was different in mice resistant or susceptible to the infection (15, 28, 29, 30). Resistance to infection was associated with TNF-α production (28, 31, 32), IL-12 production and responsiveness (30), an efficient innate antifungal effector function, and the detection of interstitial lung lymphocytes producing IFN-γ (15, 28, 29, 30). In contrast, production of IL-4 and IL-10 by interstitial CD4+ Th2 lymphocytes was associated with disease progression (15, 28, 29, 30). Th1-mediated resistance was improved upon local IL-4 or IL-10 neutralization and in IL-4- or IL-10-deficient mice and was impaired in IFN-γ- or IL-12-deficient mice (15, 28, 29, 30). The development of Th1 protective immunity also correlated with resistance to subsequent lethal infection, as observed upon exposure to sublethal doses of conidia either i.v. or intranasally (i.n.) (28, 29, 30, 33, 34). Ags and allergens of A. fumigatus have been described as being capable of inducing distinct patterns of Th cytokine production (10, 35, 36). Clinical and experimental evidence indicate that the production of cytokines from Th2 (37, 38) or Th1 (39, 40) cells, or both (41, 42), in response to different Aspergillus Ags contributes to the pathogenesis of allergic and autoimmune diseases upon exposure to Aspergillus Ags. However, no studies have addressed the role of Aspergillus Ags in the immunopathogenesis of fungal infections. In the present study the ability of distinct antigenic preparations of A. fumigatus to act as immunodominant Ags and as possible vaccines in mice with IPA was investigated. Mice were intranasally exposed to either crude culture filtrate Ags (CCFA) (41) or the 37-kDa recombinant Asp f 2 protein, which encodes a major allergen of the fungus (43). Mice were assessed for resistance to subsequent IPA and for parameters of Th immunity. We found that exposure to CCFA, but not to Asp f 2, was sufficient to induce complete resistance to the infection and lung pathology. Resistance was due to the activation of CCFA-reactive CD4+ Th1 lung lymphocytes capable of conferring protection upon adoptive transfer into naive recipients. The induction of protective Th1 cells occurred in the absence of IL-4, but not IFN-γ or IL-12. Therefore, Ag-specific, IL-12-dependent, Th1 lymphocytes mediate the vaccine-induced resistance to IPA. Inbred BALB/c (H-2d) mice (Charles River, Calco, Italy) were used. Breeding pairs of homozygous IL-4-deficient (IL-4−/−), IFN-γ-deficient (IFN-γ−/−), IL-12p40-deficient (IL-12p40−/−), and control wild-type (44, 45, 46) BALB/c mice were bred under specific pathogen-free conditions in the animal facility of the Medical School of Perugia (Perugia, Italy). Procedures involving animals and their care were conducted in conformity with national and international laws and policies. Mice of both sexes, 8–10 wk old, were used. The strain of A. fumigatus was obtained from a fatal case of pulmonary aspergillosis at the Infectious Diseases Institute of the University of Perugia. The micro-organism was grown on Sabouraud dextrose agar (Difco, Detroit, MI) supplemented with chloramphenicol for 4 days at room temperature. Abundant conidia were elaborated under these conditions. Conidia were harvested by washing the slant culture with 5 ml of 0.025% Tween 20 in normal saline and gently scraping the conidia from the mycelium with a plastic pipette (or by shaking it vigorously). Cell debris was allowed to settle by gravity, and the suspension was decanted into 50-ml plastic conical tubes. After extensive washing with saline, the conidia were counted and diluted to the desired concentrations. The viability of the conidia was >95%, as determined by serially diluting and plating out the inoculum on Sabouraud dextrose agar. For i.n. infection, immunosuppressed mice were lightly anesthetized with inhaled diethyl ether before instillation and for 3 consecutive days were given a daily suspension of 2 × 107 conidia in 20 μl of sterile saline, slowly applied to the nostrils by micropipette with a sterile disposable tip. Animals were held in an upright position until the suspension was completely inhaled, and normal breathing resumed (27). For i.v. infection, 14 days after primary i.n. challenge, mice were injected via the lateral tail vein with 5 × 106 conidia in 0.5 ml of sterile saline. Mice succumbing to fungal challenge were routinely necropsied for histopathologic confirmation of invasive aspergillosis. For histology, tissues were excised and immediately fixed in formalin. Sections (3–4 μm) of paraffin-embedded tissues were stained with periodic acid-Schiff. The Gomori methenamine silver-staining procedure was used to confirm the presence of fungal cells. For quantification of fungal growth in the organs, the chitin assay was used, as previously described (28, 29, 30). The chitin content was expressed as micrograms of glucosamine per organ. Positive control included serially diluted d(+)-glucosamine (Sigma, St. Louis, MO). The glucosamine content of lungs from uninfected mice was used as a negative control; this ranged from 0.80 to 2.25 μg of glucosamine/organ. For immunosuppression, mice were injected i.p. with 150 mg/kg of cyclophosphamide (Sigma) 1 day before challenge. For immunization, the following Ags were used. CCFA (41) was prepared by growing the organism in a synthetic broth for 2–3 wk at 37°C. Approximately 107/ml A. fumigatus conidia were inoculated into Czapek-Dox and AOAC (Association Of Analytical Chemists) broth (1/1, v/v) and incubated for 2–3 wk. The broth was separated by filtration, and the filtrate was extensively dialyzed against deionized water at 4°C. The filtrate was centrifuged, and the supernatant was freeze-dried. The protein content, reactivity with positive and negative sera, and profile in SDS-PAGE were compared with in-house standards. The freeze-dried material contained ∼40% protein by the Lowry method. The 37-kDa recombinant protein, Asp f 2, encoding an allergen of A. fumigatus was obtained as previously described (36, 43). Either type of lyophilized Ag was dissolved in distilled water and diluted to a concentration of 0.5 mg/ml sterile saline. Heat-inactivated A. fumigatus (HAF) was obtained by autoclaving A. fumigatus conidia at 121°C for 15 min. A total of 2 × 107 HAF/20 μl of saline or 10 μg/20 μl of saline (according to preliminary experiments) of each Ag preparation was given i.n., 14, 7, and 3 days before the first A. fumigatus inoculation. Because immunocompetent mice quickly clear the i.n. infection and are able to survive it (30), the mice used here were immunosuppressed, unless otherwise stated, with cyclophosphamide 1 day before infection. Endotoxin was removed from all solutions with Detoxi-gel (Pierce, Rockford, IL). Airway inflammation was analyzed in the lungs as described previously (28). For enumeration of different cells, cytospin preparations of collagenase-treated lung cells were stained with May-Grünwald-Giemsa reagents (Sigma) before analysis. To improve the distinction between neutrophils and eosinophils, a modified Diff-Quik whole blood stain procedure was used. For collection of BAL fluid, lungs were lavaged thoroughly with 0.5 ml of PBS injected via the trachea. The lavage fluid was centrifuged, and the supernatant was removed and immediately stored at −80°C until analyzed for cytokine contents. The isolation of interstitial lung lymphocytes was performed as previously described (28, 29, 30). The pulmonary vasculature was perfused with 5 ml of PBS containing 100 U/ml of heparin to eliminate peripheral blood cells, and the lungs were removed, minced, and incubated for 90 min at 37°C in digestion buffer containing 0.7 μg/ml collagenase (Sigma) and 30 μg/ml type IV bovine pancreatic DNase I (Sigma). Large particulate matter was removed by passing the cell suspension through a small, loose, nylon wool plug, and lymphocytes were enriched over a single-step Ficoll gradient. Cells were resuspended in RPMI containing 10% FCS, 2-ME (50 mM), sodium pyruvate (1 mM), HEPES (10 mM), and gentamicin (50 μg/ml; complete medium) and were plated at a concentration of 2 × 105/200 μl in 96-well microtiter plates (Falcon Labware, Becton Dickinson, Franklin Lakes, NJ) coated with 12 μg/ml hamster anti-mouse CD3 mAb (clone 32C11, PharMingen, San Diego, CA). After 48-h culture, supernatants were harvested, and cytokine production was determined by specific ELISA. CD4+ T cells (>95% pure on FACS analysis) were purified from lungs or spleens using anti-mouse CD4-conjugated magnetic MicroBeads (Miltenyi Biotech, Bergisch Gladbach, Germany). Briefly, 1 × 107 total cells were incubated with 10 μl of MACS, magnetic cell sorting of CD4+ MicroBeads for 15 min at 6°C, washed, and magnetically separated with a positive selection column, according to the manufacturer’s instructions. Dendritic cells (DC) were separated from lungs and spleens using N-418-conjugated MicroBeads (Miltenyi Biotech) followed by magnetic separation according to the manufacturer’s instructions. On FACS analysis, the purified populations reacted positively with mAb to FcRII, C3biR, and mAb NLDC-145 and were negative upon staining with mAb F4/80 as described previously (47, 48). An adoptive transfer model known to modulate airway immune reactivity in a mouse model of asthma was adopted (49). Mice were injected with CCFA or Asp f 2 Ags or with vehicle alone (hereafter referred to as untreated) as described above before receiving the i.n. challenge with Aspergillus conidia (2 × 107 conidia/injection, three times). Treatment with cyclophosphamide was purposely omitted so as not to compromise splenic cell recovery and reactivity. For adoptive transfer, CD4+ T cells were purified from spleens 14 days after the i.n. challenge and restimulated in vitro with DC from the same mice and the relevant Ag for 3 days before cell and supernatant collection. Flow cytometric analysis revealed that cultured lymphocytes from CCFA-treated mice consisted of CD3+ cells (95% in both populations from CCFA-treated and mock-treated mice), CD4+ cells (87 and 90%), CD8+ cells (9 and 7%), CD44high (99 and 43%), and Mel-14low (70 and 23%). Five × 105 cells were injected i.v. to naive recipients 1 day before the i.v. challenge with 5 × 106 Aspergillus conidia. Purified lung CD4+ T cells (5 × 105) were cultured with 5 × 104 purified lung DC in 200 μl of complete medium, in flat-bottom 96-well microtiter plates (Falcon) in the presence of 1 μg/ml CCFA or Asp f 2 or 1 μg/ml Con A for 4 days at 37°C in 5% CO2 (according to preliminary experiments indicating the doses at which optimal proliferation is obtained). Eight hours before harvesting, cells were pulsed with 0.5 μCi of [3H]thymidine/well. Incorporation into cellular DNA was measured by liquid scintillation counting. The results are expressed as the mean counts per minute ± SE. The levels of IL-12p70 and IL-10 in BAL fluids and of IFN-γ, IL-2, and IL-4 in culture supernatants of activated cells were determined by cytokine-specific ELISA, using pairs of anti-cytokine mAbs as described previously (28, 29, 30). The Ab pairs used were as follows, listed by capture/biotinylated detection: IFN-γ, R4-6A2/XMG1.2; IL-2, JES6-1A12/JES6-5H4; IL-4, BVD4-1D11/BVD6-24G2; and IL-10, JES5-2A5/SXC-1 (PharMingen). IL-12p70 was determined using an ELISA kit (R&D Systems, Space Import-Export, Milan, Italy). Cytokine titers were calculated by reference to standard curves constructed with known amounts of recombinant cytokines (from PharMingen or, for IL-12, R&D Systems). A micro-ELISA procedure was used to quantitate total IgE in the BAL fluid as described previously (29, 46). Total lung cells were subjected to RNA extraction by the guanidium thiocyanate-phenol-chloroform procedure, as previously described (28, 29, 30). Briefly, 5 μg of total RNA was reverse transcribed into cDNA using Moloney murine leukemia virus RT (Life Technologies, Gaithersburg, MD). The cDNA was then amplified using specific primers for murine IFN-γ, IL-4, IL-10, IL-12 receptors β1 and β2 (IL-12Rβ1 and IL-12Rβ2), and hypoxanthine-guanine phosphoribosyl transferase (HPRT) as described previously (28). Amplifications were performed in 2 mM MgCl2, 50 mM KCl, 10 mM Tris-HCl, (pH 8.3), 0.2 mM of each deoxynucleotide triphosphate, 1 μM of each primer, and 2.5 U of AmpliTaq polymerase (Perkin-Elmer/Cetus, Norwalk, CT). The cDNA was amplified in an automated thermal cycler (Perkin-Elmer/Cetus) as described previously (28). Amplification was stopped at 35 cycles. The HPRT primers were used as a control for both RT and the PCR reaction and also for comparing the amounts of products from samples obtained with the same primer. The PCR fragments were analyzed by 1.5% agarose gel electrophoresis, stained with 0.5 mg/ml ethidium bromide, and visualized using a UV transilluminator. Survival data were analyzed using the Mann-Whitney U test; significance was defined as p ≤ 0.05. Student’s t test was used to determine the statistical significance of values (mean ± SE) between experimental groups. In vivo groups consisted of four to six animals. The data reported were pooled from at least three experiments. Multiple i.n. inoculations of A. fumigatus conidia in immunocompetent DBA/2 mice caused a transient, self-limiting infection that conferred immune resistance to subsequent infection (28). Here we show that a similar result was obtained in BALB/c mice, in that mice surviving an i.n. exposure to Aspergillus conidia also showed increased resistance to local or systemic subsequent infection, as indicated by the increased survival and decreased fungal growth in organs (Table I⇓). Interestingly, no protection was observed following a primary intragastric Aspergillus infection (data not shown). On assessing the capacity of inactivated Aspergillus conidia or different Aspergillus Ags to induce protection to subsequent infection, we found that treatment with HAF or Asp f 2 did not protect mice against the i.n. or i.v. infection. Coadministration of IL-12 did not induce protection (data not shown). In contrast, immunization with CCFA induced significant protection against both types of infection, as judged by marked reduction of the fungal growth in the organs and the ability of the majority (>80%) of mice to survive an otherwise lethal intranasal infection or to partially resist the i.v. infection. Remarkably, CCFA-induced protection was also observed in DBA/2 mice (data not shown), which are more susceptible than BALB/c mice to pulmonary and invasive aspergillosis (15, 28). CCFA-induced protection correlated with the local recruitment of lymphocytes and macrophages more than neutrophils, as indicated by cytospin preparations of collagenase-treated lungs and lung histology. We have shown that leukocyte recruitment into the lungs of infected and immunosuppressed mice occurred despite a profound leukopenia (28). The percentages of lymphocytes (30%) and macrophages (36%) recruited at the site of infection were significantly higher in CCFA-treated mice than in Asp f 2-treated mice (17 and 22%, respectively) or untreated mice (16 and 20%, respectively). In addition, the percentages of neutrophils (33%) and eosinophils (1%) were significantly lower in CCFA-treated mice than in Asp f 2-treated (61 and 10%, respectively) or untreated mice (56 and 8%, respectively). Lung sections from CCFA- or Asp f 2-treated or untreated mice revealed patterns of lesions similar to those observed in invasive and noninvasive pulmonary aspergillosis (28, 29, 30). Resistant, CCFA-treated mice revealed the presence of few infiltrates, consisting of rare, small hyphae with a moderate infiltration of predominant inflammatory mononuclear cells in the peribronchial region (Fig. 1⇓A). In contrast, lung sections from Asp f 2-treated mice (Fig. 1⇓B) revealed patterns of lesions similar to those observed in untreated mice (Fig. 1⇓C), characterized by signs of bronchial wall damage, peribronchial necrosis, and the presence of numerous infiltrating (predominantly polymorphonuclear) cells. Lung histology of mice with invasive aspergillosis upon treatment with different Aspergillus Ags. Periodic acid-Schiff-stained sections were prepared from lungs of BALB/c mice treated with Aspergillus crude culture filtrate Ags (A) or the recombinant protein Asp f 2 (B) or were untreated (C), and infected i.n. with Aspergillus conidia after being immunosuppressed with cyclophosphamide 1 day before the infection. Lungs were taken 5 days after infection. A, Note the presence of few infiltrates, consisting of rare, small hyphae with moderate infiltration of predominant inflammatory mononuclear cells in the peribronchial region (inset of A). 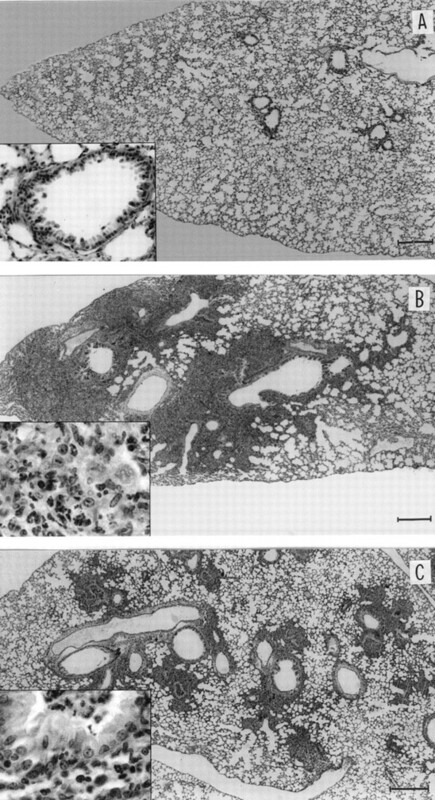 In contrast, the sections from the lungs of Asp f 2-treated mice (B) revealed patterns of lesions similar to those observed in untreated mice (C), characterized by signs of bronchial wall damage, peribronchial necrosis, and the presence of predominant infiltrating neutrophils (insets of B and C). Bar, 400 μm; 100 μm in the inset. To evaluate whether the activation of local, specific T lymphocytes to Aspergillus Ags had occurred in infected mice pretreated with the different Ags, lung lymphocytes or purified CD4+ T cells were assessed for proliferation in vitro. Cells from untreated mice, CCFA-treated mice, or Asp f 2-treated mice were cultured in vitro with the relevant Ags in the presence of lung DC from the same mice (in the case of CD4+ T cells). The results (Fig. 2⇓A) indicate that lung cells from untreated or CCFA-treated mice proliferated in response to Con A and to some extent in response to the CCFA or Asp f 2 Ags. However, in untreated mice CD4+ T cells only proliferated in response to Con A (Fig. 2⇓B), while in mice immunized with CCFA, CD4+ T cells strongly reacted to the CCFA Ags, but not to the Asp f 2 Ag (Fig. 2⇓B). Treatment with Asp f 2 did not induce Ag-specific proliferation (Fig. 2⇓). Thus, the proliferative response to Asp f 2 Ag observed in mice untreated or treated with CCFA may be due to cells other than CD4+ lymphocytes. 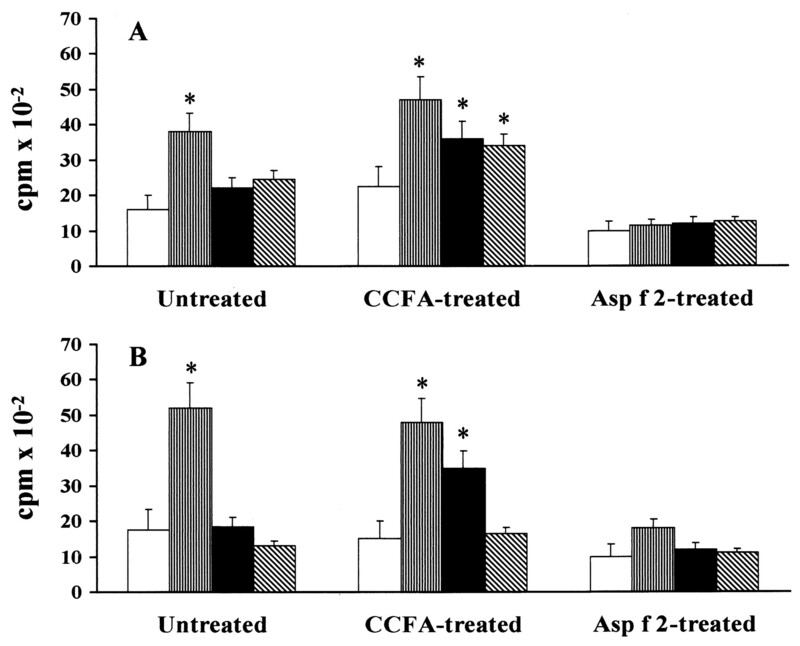 In vitro proliferative response of unfractionated (A) or CD4+ (B) lung cells from mice with invasive aspergillosis, either untreated or treated with Aspergillus CCFA or the recombinant protein Asp f 2. Cells were unstimulated (□) or were stimulated with Con A (▥), Aspergillus CCFA (▪), or the recombinant protein, Asp f 2 (▧), with (B) or without (A) purified lung DC (see Materials and Methods for details), for 4 days at 37°C in 5% CO2. Eight hours before harvesting, cells were pulsed with 0.5 μCi of [3H]thymidine/well. Results are expressed as the mean counts per minute ± SE of triplicate samples. ∗, p < 0.05, mitogen- or Ag-stimulated vs unstimulated. To look for patterns of cytokine and Ab production in response to the different Aspergillus Ags, the levels of IL-12p70, IL-10, and IgE were determined in BAL fluids and those of IFN-γ, IL-2, and IL-4 were determined in culture supernatants of anti-CD3-stimulated lung lymphocytes soon after infection. The results (Fig. 3⇓) show that 3 days after infection, the production of IL-12p70 was significantly increased, while that of IL-10 was significantly decreased in BAL from CCFA-treated mice with respect to untreated or Asp f 2-treated animals. 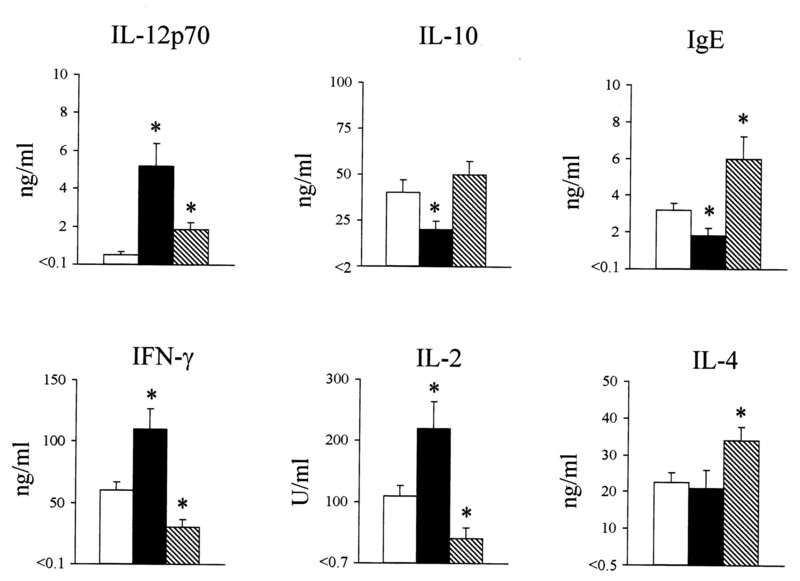 The production of IFN-γ and IL-2 was also significantly increased in CCFA-treated mice 7 days after infection at the time when the levels of IgE in BAL were significantly lower than those found in untreated or Asp f 2-treated mice (Fig. 3⇓). The production of IL-4 was significantly increased upon Asp f 2 treatment. Studies performed on IL-12-, IFN-γ-, or IL-4-deficient mice revealed that the immunization capacity of CCFA was lost in the absence of IL-12 and IFN-γ and was potentiated in the absence of IL-4. 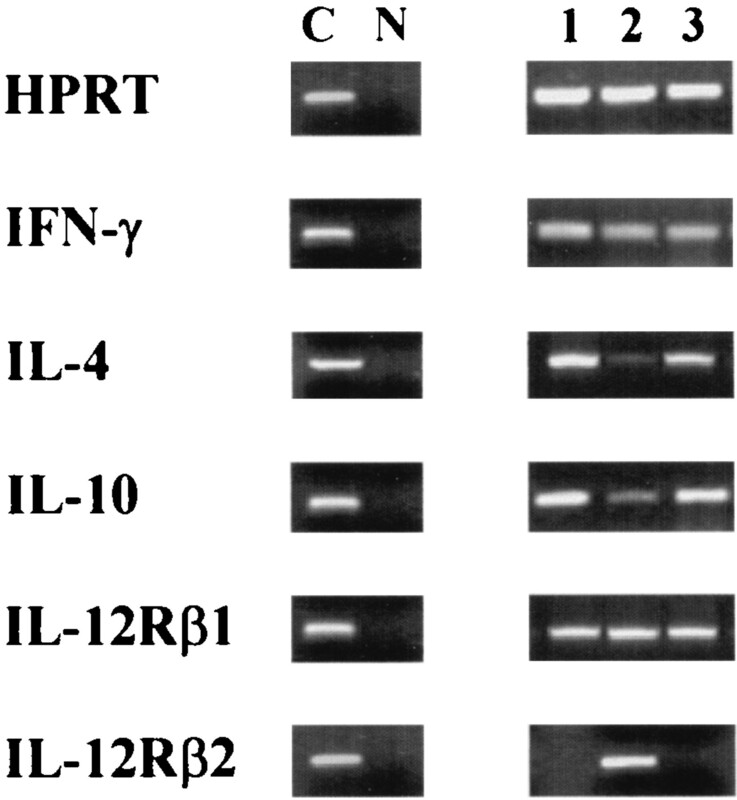 Indeed, the fungal growth in the lungs was not inhibited in the absence of IL-12 and IFN-γ, but was greatly reduced in the absence of IL-4 (Table II⇓). Cytokine and IgE contents in mice with invasive pulmonary aspergillosis, either untreated (□) or treated with Aspergillus CCFA (▪) or the recombinant protein Asp f 2 (▧). IL-12p70 and IL-10 were determined in the BAL fluids 3 days after infection, and IgE was determined 7 days after infection. IFN-γ, IL-2, and IL-4 were determined in culture supernatant of anti-CD3-activated lung cells 7 days after infection. Culture supernatants of lung cells were collected after 48-h incubation at 37°C in 5% CO2. Cytokine and IgE levels were determined by specific ELISA. Cytokine contents in cultures from uninfected and untreated mice were below the detection limit of the assay (indicated by < on the y-axis). ∗, p < 0.05, CCFA-treated or Asp f 2-treated vs untreated. To assess whether the induction of Ag-specific CD4+ T lymphocytes, producing IFN-γ and IL-2, is correlated with protection against IPA, splenic CD4+ T cells from untreated, CCFA-treated, or Asp f 2-treated mice were cultured in vitro with the relevant Ag and DC, and adoptively transferred into naive BALB/c mice 1 day before i.v. infection with A. fumigatus. The results (Table III⇓) indicate that adoptive transfer of CD4+ T cells from CCFA-treated mice significantly prolonged survival after the infection, while adoptive transfer of cells from Asp f 2-treated or untreated donors did not. On looking at the pattern of cytokine and cytokine receptor gene expression by adoptively transferred cells, we found that the messages for IFN-γ and IL-12Rβ2 were both expressed in cells from CCFA-treated mice, while those for IL-4 and IL-10 were almost undetectable. In contrast, the IL-12Rβ2 message was undetectable in cells from untreated or Asp f 2-treated mice, while those of IL-4 and IL-10 were present (Fig. 4⇓). Because the expression of the IL-12Rβ2 positively correlated with the induction of Th1 lung lymphocytes in mice with aspergillosis (30), these results indicate that the transferred cells from CCFA-treated mice were of the Th1 phenotype. Cytokine and cytokine receptor gene expression in CD4+ T cells from spleens of mice either untreated (lane 1) or treated with Aspergillus CCFA (lane 2) or the recombinant protein Asp f 2 (lane 3) before i.n. infection with Aspergillus conidia. CD4+ T cells were purified 14 days after i.n. infection and were restimulated in vitro with the relevant Ags and purified DC for 3 days before cell collection and adoptive transfer into naive recipients. Cytokine and cytokine receptor gene expression were assessed by RT-PCR. C, specific positive controls for HPRT or cytokines or IL-12R β-chains; N, no DNA added to amplification mix during PCR. The present study shows 1) the development of protective Th1 memory responses as a result of nasal exposure to A. fumigatus conidia of immunocompetent BALB/c mice, 2) the activation of CD4+ Th1 cells specifically reacting to Aspergillus CCFA, and 3) the ability of CD4+ Th1 cells, specifically reacting to CCFA, to confer protection upon adoptive transfer into naive recipients. Upon inhalation, A. fumigatus conidia are rapidly eliminated from the respiratory tract through the combined activity of physical barriers and local humoral and cellular innate immunity (3, 10). However, clearance of the fungus from primary sites of infection may not necessarily result in the induction of protective adaptive Th immunity, as clearly shown by the results of the present study. No protection against reinfection was observed in immunocompetent mice infected intragastrically with the fungus. Although a transient fungal growth in the stomach was observed (data not shown), mice eventually cleared the infection, with no signs of activation of protective immunity at distant sites. In contrast, i.n. exposure to the fungus resulted in the induction of protection to either local or remote reinfection, a finding in line with previous data showing the occurrence of acquired Th immunity in mice with IPA (28, 29, 30). Because the ingestion of Aspergillus spores is suspected of causing fatal cases of aspergillosis in humans (3, 50), the lack of induction of an efficient immune response to ingested spores in addition to other factors (3, 11) may contribute to the infectivity of the fungus upon ingestion. The above finding also points to the important role played by the mucosal immune system in response to inhaled Ags (51). Ags that encounter the nasal mucosal immune system can initiate two types of local and remote immune responses, leading to the induction of immunity (52, 53) or tolerance (54, 55, 56). The functional outcome of immunity or tolerance in response to inhaled Ags can be influenced by host genetics, environmental factors, and Ags (51). Here we show that exposure of immunocompetent BALB/c mice to viable, but not inactivated, conidia resulted in the activation of Th1-type reactivity mediating resistance to local or systemic reinfection, a finding similar to that in DBA/2 mice (28). However, on assaying the abilities of different Aspergillus Ags to modulate mucosal and systemic immune Th reactivity to the fungus, we found differences between the CCFA and the Asp f 2 Ags. Immunization with CCFA resulted in the activation of CD4+ lung lymphocytes that proliferated in response to the Ag and produced IFN-γ and IL-2. The induction of Th1 cells was IL-12 dependent, as indicated by loss of the immunization potential of CCFA in the absence of IL-12. The activation of protective Th1 cells also occurred in the periphery, as evidenced by the ability of CD4+ Th1 splenocytes to confer resistance to infection upon adoptive transfer into naive recipients. These data indicate that CCFA may act as an immunodominant Aspergillus Ag, capable of inducing specific Th1 lymphocytes and of being recognized by them. That A. fumigatus extracts have antigenic properties has been recognized for a long time and has served as the basis for the early development of immunological assays used in the serological diagnosis of aspergillosis (10). CCFA in particular has been useful in detecting serum Ab levels and skin reactivity in human patients (43, 57). In contrast to CCFA, Asp f 2 Ag administration did not increase resistance to infection (indeed, it may have exacerbated it) and failed to induce the activation of Ag-specific proliferating Th1 cells capable of conferring protection upon adoptive transfer. High levels of IgE, IL-4, and IL-10 and low levels of IL-12 and IFN-γ were found upon Asp f 2 Ag administration, thus confirming the Th2-promoting ability of the Ag (35, 36, 43). Interestingly enough, the Asp f 2 Ag, while not able to induce Ag-specific lymphoproliferation, was nevertheless recognized to some extent by lung lymphocytes from CCFA-treated mice. This finding is in line with observations in humans showing that Asp f 2, while strongly reacting with IgE Ab in patients with ABPA (58), did not elicit reaction in Aspergillus-sensitive subjects with asthma and normal control subjects (36). Overall, these results suggest that different Ags of Aspergillus come to play in setting mucosal immune reactivity to the fungus that is believed to result from multiple induction Th pathways (42). The mechanisms underlying the activation of Th1 or Th2 cells by the different Aspergillus Ags are not yet defined. The type of Th cell responses to Ags encountered on the mucosal surfaces of the respiratory tract may be influenced by regional environmental factors, such as the nature of regional innate immunity (59) and the expression of costimulatory molecules (60, 61). The recruitment and activation of inflammatory cells in the setting of pathogen challenge in the lung are complex and dynamic processes that involve the coordinated expression of both pro- and anti-inflammatory mediators, such as chemokines and cytokines (62). Indeed, although an inflammatory response is essential to clear pathogens from the site of infection, a prolonged inflammatory response might worsen lung injury and could actually interfere with pathogen elimination (63). Here we found that, similar to what was observed in mice resistant to IPA (28, 29, 30), the overall inflammatory response was mitigated in CCFA-treated mice compared with that in Asp f 2-treated or untreated mice, as judged by the histology and the reduced number of recruited neutrophils at the lesion sites. A recent study indicated that TNF-α and chemokines orchestrate the lung inflammatory response to IPA (31, 32), so that in vivo depletion of TNF-α resulted in a reduction in lung neutrophil infiltration and a reduced production of C-X-C and especially C-C chemokines. It is conceivable that the same mediators are at work in the recruitment of neutrophils in response to Aspergillus Ags. Decreased production of monocyte chemoattractant protein-1 was indeed observed in CCFA-treated mice compared with Asp f 2-treated or untreated mice (data not shown). Interestingly, we also found that production of IL-17, which is known to mediate neutrophil recruitment in the airways via C-X-C chemokines (64), was reduced in mice treated with CCFA (data not shown). As IL-17 is released by activated T lymphocytes (65), this finding suggests a further mechanism of neutrophil recruitment that is linked to the activation of T lymphocytes into the airways. Further studies will elucidate the role played by Th cytokines, including IL-17, in the feedback regulation of neutrophil recruitment and effector functions in the lungs of mice with IPA. The induction of Th1 protective responses to IPA was inhibited by IL-4 (30). An inverse correlation was found between the levels of Th2 cytokines and the extent of the fungal growth in the lungs (30), a finding in line with the notion that against Aspergillus species, Th1 (IFN-γ/TNF-α) and Th2 (IL-4/IL-10) cytokines are found to have opposing effects on phagocytic host defenses (66). Because the induction of nonprotective Th2 responses was sufficient to prevent the development of protective Th1 responses to IPA (30), this may account for the failure of Asp f 2 treatment to induce Th1 responses, in that high levels of IL-4 and IgE were observed. Mitogen- and Ag-specific proliferation was also impaired, thus indicating the occurrence of a state of lymphocyte unresponsiveness following treatment with Asp f 2. However, whether Th2 cells or some regulatory cells, known to mediate some forms of nasal tolerance (67), mediate the effects of Asp f 2 in IPA remains to be determined. The occurrence of autoreactivity in patients suffering from chronic A. fumigatus allergy (39, 40) indicates the complexity of the allergic responses to Aspergillus. A number of studies indicate that lung DC play a primary role in surveillance of pathogenic Ags and initiation of a primary immune response in the lung (47, 68, 69). It has been suggested that dysfunctional DC may contribute to the pathogenesis of lung diseases, including allergy (68, 69, 70). Therefore, it is possible that the induction of different Th cells in response to CCFA and Asp f 2 may also result from aberrance of host DC functions. In conclusion, the results of the present study indicate the existence of Aspergillus Ags capable of inducing Th1- and Th2-type reactivity during infection, a finding that suggests that the potentially protective immune responses elicited by Th1 Ags could be inhibited by competing responses to Th2 Ags. However, Th1-mediated resistance to IPA was induced upon vaccination with the Aspergillus crude culture filtrate Ags. One major drawback of studies with Aspergillus Ags is that inhalation of A. fumigatus Ags by mice of different strains produced lung lesions of different severities (71), a finding supporting the body of evidence that genetic factors may modify lung responses to the fungus, as clearly shown in human ABPA (72, 73). Therefore, the finding that the immunization capacity of the CCFA is retained in different strains of mice suggests that Aspergillus Ags exist that may fulfill the requirements for a candidate T cell vaccine in aspergillosis. We thank Jo-Anne Rowe for editorial assistance, and Dr Paolo Mosci of the animal facility at the University of Perugia for the histology. ↵1 This work was supported by the National Research Project on AIDS (Contract 50B.33, Opportunistic Infections and Tuberculosis, Italy), the National Institutes of Health, (AI42349), and the Veterans Affairs Medical Research Division. ↵3 Abbreviations used in this paper: IPA, invasive pulmonary aspergillosis; Asp f 2, Aspergillus allergen; ABPA, allergic broncho-pulmonary aspergillosis; i.n., intranasally; CCFA, crude culture filtrate Ags; HAF, heat-inactivated Aspergillus fumigatus; BAL, bronchoalveolar lavage; DC, dendritic cells; HPRT, hypoxanthine-guanine phosphoribosyl transferase. Rhodes, J. C. 1993. Aspergillosis. In Fungal Infections and Immune Responses. J. W. Murphy, H. Friedman, and M. Bendinelli, eds. Plenum Press, New York, p. 359. Cenci, E., A. Mencacci, G. Del Sero, C. Fè d’Ostiani, P. Mosci, M. Kopf, and L. Romani. 1998. IFN-γ is required for IL-12 responsiveness in mice with Candida albicans infection. J. Immunol. 161, 3543.